3M ScotchPad Adhesive Hang Tabs can turn an ordinary poly bag into a display ready retail product for your business. 3M Hanging Tabs help increase sales, increase your product’s awareness and maximize merchandising opportunities. The product can be right at eye level on a display where customers see it, which helps increase impulse purchases. 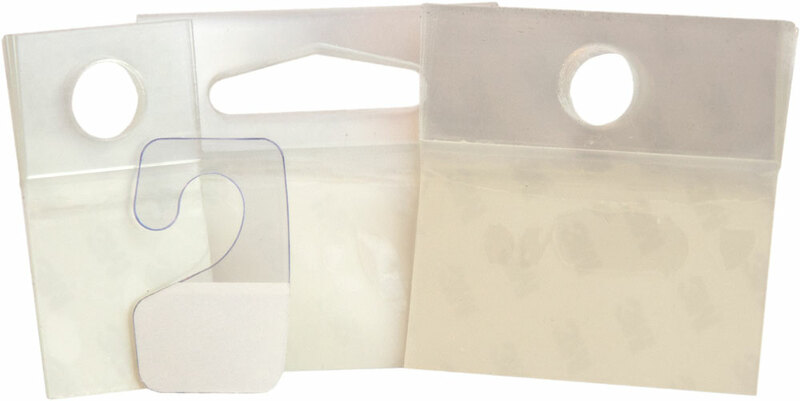 These ScotchPad Adhesive Hang Tabs can help squeeze more product in the same space while also allowing repair or reinforcement of damaged packaging. Clear, sturdy polyester tabs with pressure-sensitive adhesive backing. Sticks to most product or packaging surfaces so that the item can be displayed. Round holes, delta hole, or J-hook designs accommodate all retail pegs. 10 tabs to a pad. Adheres instantly to shrink-wrapped packages, cartons, and product surfaces. ScotchPad hang tabs 1074/1075/1076 have bendable tabs. Strong abrasion, edge tear and split resistant backing.